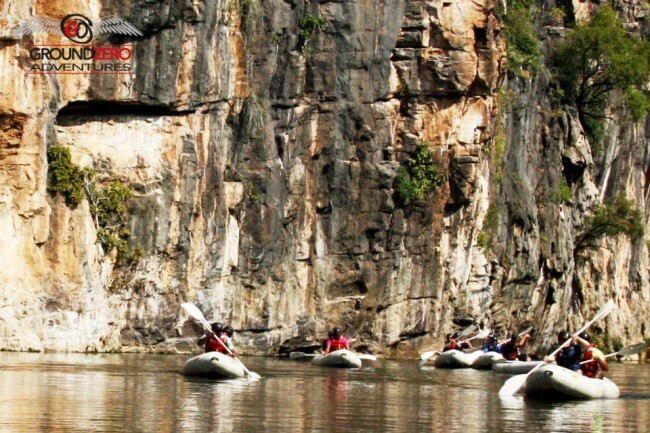 Whether you are looking for a fun low impact day out, exhilarating adventure, outcomes based activity or a combination of them all, we at GROUND ZERO ADVENTURES in Gauteng can tick all the boxes. With modern conference facilities and accommodation for over a hundred guests we can tailor any package required for you company, occasion, church or bachelor party. Based close to Harties only 35 km’s from both Sandton and Pretoria and 15 km’s from Lanseria, we are ideally situated for all your Team Build and Conference requirements. Offering fully guided river rafting, quad trails, abseiling or a bush cook off competition, we have many activities and combinations. Catering for all needs and budgets you can choose one activity or combine a few, pop in for a day or stay a few in either our tented base or the Lodge, we will enthuse your team in our bush surroundings which boasts lots of game including wildebeest, kudu, zebra and blesbok. Call Ground Zero Adventures today so we can collaborate and plan the Team Build to suit your teams needs and desires.